Friend: Do you have any plans for this weekend? Friend: Okay, pack your bags…we are going on an unplanned trip this weekend..meet me on Friday at 7 pm Mumbai Central. Friend: No but’s, just come.. I promise you, you won’t regret your decision and don’t worry about your job we will be landing on Monday at 7 am. So this is how our journey started. As it was Tracial – an unplanned trip arranged by Gautam, it was going to be completely RAW for which my mind was already prepared. It was surprising to see 17 more travelers joining this event to do some crazy stuff. We all reached the station, there were 2 trains one Gujarat and other Amritsar. We entered the Amritsar one, at every single station I was asking Gautam to show the tickets but as the time passed we all started connecting with each other and I didn’t want to know about the destination anymore. 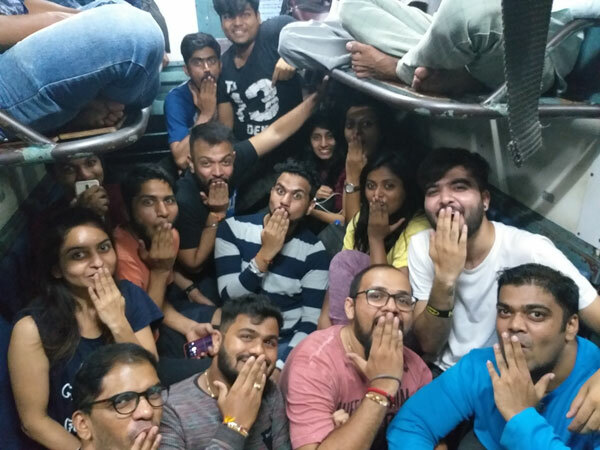 There we were on that train playing cards, antakshari, dumb charades, chidiya udd, Chinese whispers and most importantly red hands It was really crazy. The best part was the photos which captured our memories, thanks to Heramb and his action camera. The most important part of any travel is to know the stories and experiences of every co-traveler. It was a really blessed moment to meet Dipti and Saurabh on this trip and inspiring one to know how they both started NGO named UPASANA, really looking forward to help you guys with this Social Event. Within such a limited span of time, all these unknown ppl became a small family. Friends that I can count on Heart. Now the main part of our tour… we all used the public transport and tried to provide employment to the locals during our journey. By doing our crazy stuff we tried to put a smile on everyone’s face. Sometimes it’s important to put ourselves in other’s shoes to know what kind of life they live. It was really different to sleep on the floor of the train or eat on the platform. This was new for me but I really enjoyed as it was all about trying to do things which are out of our comfort zone. This trip gave a new perspective, it is great to have a comfortable life which our family provides because of which we are independent, but sometimes it’s necessary to live someone’s else life in order to know what kind of changes need to be made to improvise something in the society. What is needed is little guidance which can be provided by us. There are a lot of things to be learned from them as well. It’s all about exploring ourselves and others. Looking forward to going for such kind of trips and also helping others.Oh wait I didn’t mention the place where we went. 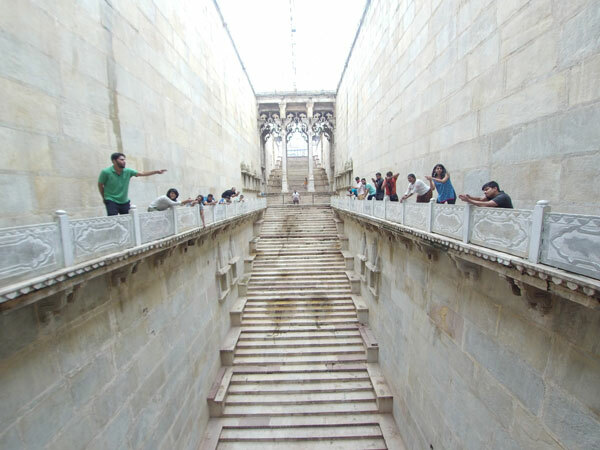 So we explored the unexplored places in Kota. It was really a breathtaking place you could ever visit. The photographs say it all. I would like to suggest you all spare some time and go on such kind of trips which will really change the perspective of living because LIFE is meant to be lived. First Tracial and it’s craziness! This couple Dipti & Saurabh at Upasana Society NGO have been dedicating their entire time in small and big social causes around them. They successfully completed Prekking (Picking up waste while Trekking) at a few locations in and around Mumbai. 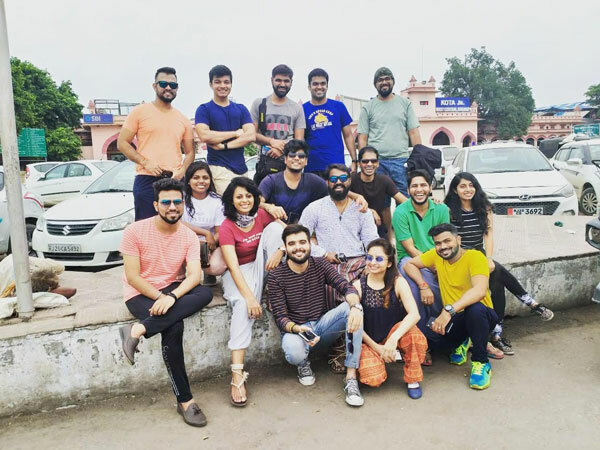 But as restless and needy of new campaigns, they came up with a new concept of Tracial, which means Unplanned Travel with a Social Touch to it. How amazing? And what more did they need? A crazy soul that could make this idea work. They found Gautam of Trekraw, a soul so crazy, who craves new adventures every day, who believes in uniqueness about everything. So, the dates were set to be last Weekend of August month and they started putting out a word about this Tracial on social media, not knowing who and how many crazy people will join for this unplanned trip to an unknown destination, that too for a weekend. You need to go out of your comfort zone to dedicate your sleep, peace and family time of Saturday & Sunday, to go with some unknown people to an unknown place, without any bookings. Yeah, and the registrations closed within a week and suddenly there were 18 crazy people out there, all excited for the new experience they were about to witness. On Friday 31st Aug, we all were asked to gather at Mumbai Central railway station ticket window, at around 7 pm. Most of them came directly from work. Once we got the presence of everyone who had registered, Gautam bought the tickets, still not revealing the destination or other details. And finally at around 9.30 pm, we boarded the general compartment of The Golden Temple Mail. We got seats to sit and we settled with a round of introduction. It wasn’t more than an hour that everyone was comfortable with each other and the fun part was- that it didn’t look like we all had met for the first time. The night went by with a lot of fun, card games, pranks, sharing of food and stories & clicking a lot of funny pictures. It was just when we were suddenly asked to pack bags and gather belongings that we knew that Oh! We are about to reach somewhere. Where? We still didn’t know, and yay! We were at Kota station. Little did we know that a guy had some dope confidence of taking 18 unknown people to such a faraway place for such a short weekend! Now, another shock was that our hotel wasn’t booked and nothing else was planned. A bunch of us went and figured a nearby hotel and we all went to freshen up and change, and we were to meet in half n hour at the reception of the hotel. Yes, we shared our rooms with these crazy people, each happy with their roommates and arrangements which were unexpectedly fun filled. We got out to visit two places, of course as guided by Gautam, in local transport, with around 14 pax in one vehicle and 4 pax Ina local auto rickshaw. It was a long ride be we kept on mingling and singing and the fun continued till we reached the first spot. The place belonged to Rajasthan Government, a tiger reserve in Kota. Wow! 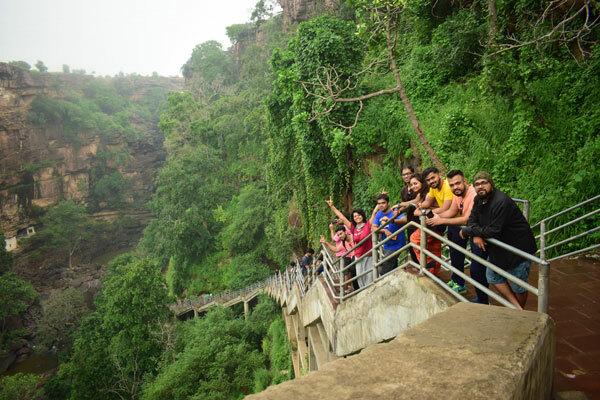 And the team witnessed some peacocks, baboons, monkeys, rare birds and rarest beauty of nature. We all did photo sessions for an hour and headed back to our vehicles for visiting the second place, which we had to finish before sunset due to safety reasons! We reached a place, some half an hour after starting from the Forest reserve. There wasn’t anything about this place that was less than magnificent and holy. All surrounded by baboons and waterfalls, the dainty rocks and mountains looked incredibly surreal. The stairs went down to a pious temple, so slippery and dangerous all around to walk down, we all were in awe of the place. We were monitored by the Kota Rescue Force throughout. It was a great experience to get blessings from within God’s own Den! While on our way back to our hotel, we also dropped in at a friend’s organic juice centre and had some amazing juices and purchased few organic products. The hospitality from this entire city was commendable, not to mention the tastiest food at unbelievably cheap prices. It was the next morning, on Sunday 2nd September, that I figured the bonding with everyone was so strong for a first timer with them, we had a sleepless night full of fun, the way sometimes we can’t be comfortable with our own friends from lifetime. 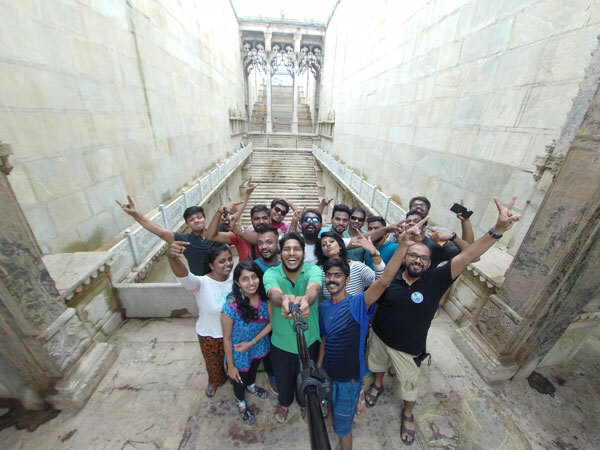 The group did a short visit to Bundi, a historical place from 1700 AD, we picked some yummy varieties of stuffed paratha, ate on the platform like boss and took the golden temple mail back at 2.20 pm. We had reservations for our return but since the waitlist didn’t get confirmed, we were roaming around into the 2-3 boggies and spent a lot of time near the door, getting off at every station the train halted at, making new memories and had so much fun. We started parting at around 4 am when the train reached Mumbai! Tracial, the social touch of spreading awareness on cleanliness and not littering any place, taking care of our own wastes, empowering the locals to earn out of their hospitality and services, became a fun-filled experience for each one of us! It is by far the best trips I have ever had and am sure everyone has a hangover of it, even on the second day of our return..